This classic French dish is wintry comfort food at its best - and an easy recipe to prepare ahead. Sprinkle the flour onto a plate and dredge the chicken pieces in the flour to coat thoroughly. Heat 50g/2oz of the butter in a large ovenproof casserole over a high heat. When the butter is foaming, add the chicken pieces, in batches, skin-side down, and fry for 2-3 minutes, or until browned on each side. Remove the chicken from the pan, then add the chopped white onion and fry for 1-2 minutes. Return the chicken to the pan, add the bacon lardons and fry for a further 1-2 minutes, or until just starting to crisp. Pour in the red wine and brandy, add the garlic, bay leaf and thyme, then bring the mixture to the boil. Reduce the heat until the mixture is simmering and simmer for 1 hour, or until the chicken is tender and cooked through to the bone, with no trace of pink remaining. While the chicken cooks, bring the potatoes to the boil in a pan of cold, salted water. Reduce the heat and simmer the potatoes for 12-15 minutes, or until tender. Drain well and return to the pan, then place the pan over a low heat for a couple of minutes to dry the potatoes slightly. Mash the potatoes through a ricer until very smooth, then beat in 100g/3½oz of the remaining butter and all of the cream. Season, to taste, with salt and freshly ground black pepper. Keep warm. When the chicken is tender, heat the remaining butter in a frying pan over a medium heat. Add the silverskin onions and button mushrooms and fry until golden-brown, then stir them into the coq au vin and season again. 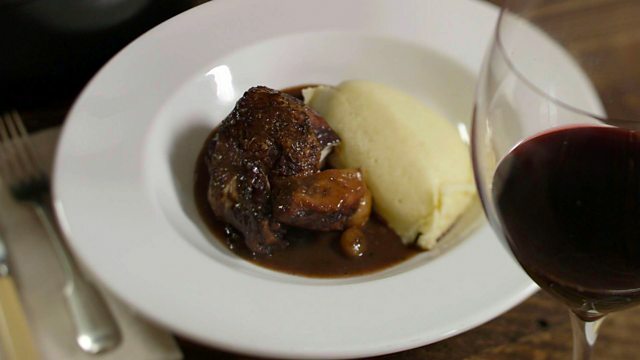 To serve,ladle the coq au vin onto serving plates with a dollop of mashed potatoes alongside.